Special! 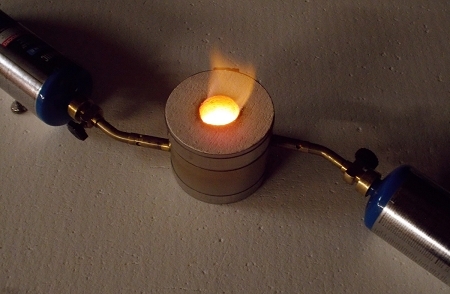 Portable propane fired kiln designed to melt precious metals with speed and ease. Melt up to 6 oz of fine placer gold (1 to 3 oz silver) - take it to the field with you! 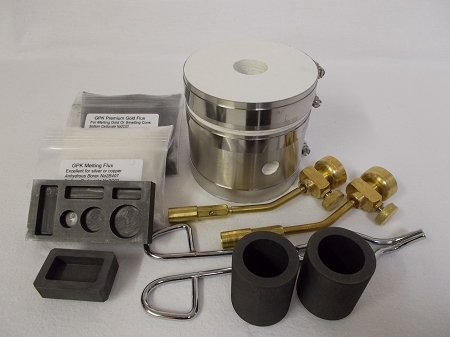 Kit includes 4" OD x 4" tall kwik kiln, (2) NAC-500 mini graphite crucibles, (1) graphite 2 oz gold (1 oz silver or copper) loaf mold, (1) graphite 6 cavity gold mold (1/4, 1/2 & 1 oz round and loaf molds), 8" scissor tongs, 8 oz white melting flux for silver or copper and 8 oz premium black gold flux. Reaches melting temperature in 10 minutes without over-firing. Flame is more stable; can set canister down after lighting without having to re-adjust flame. Please note: This mini kiln is not recommended for smelting ore concentrates, due to the limited capacity for 1 to 3 ratios needed. The purer the metal, the less flux is needed, since flux is designed to pull out impurities.